"Okay.... So... Tables moved and out of the way, check... Counter and serving tables set up, check..." Ice Storm began to list off as she started moving from point to point, making sure the Hors d'œuvres that she had already provided where neatly arragned, although she had the more delicate ones sitting in block of ice. They were tiny little chocolates with a variety of different ice creams inside of them. Of everything that she had made for the Gala tonight, these had been the most time consuming because the chocolate had to be at the perfect temperature to where she wouldn't melt the ice cream or harden the chocolate too fast. Even with her affinity towards ice magic this proved to be quite the challenge for her. she quickly popped one of the strawberry ones into her mouth to make sure once again that they were the right consistency. "Mmm. Tasty treats, check!" she continued as she looked at the time. It was nearly sun-down, the Gala would be starting soon. With what small amount of time before she had left, she went upstairs and slipped into her favorite white dress that she had just gotten replaced by Rarity not so much as a week ago. It was satin white, and fit her quite elegantly as the crest was embedded with frosted topaz, and had more of the frosted gem running along each hem of the dress with what looked like a small gust of wind sewn into the pattern, almost making it look like it was blowing small bits of ice around her. She also affixed two blue topaz earrings and another small piece of topaz in her mane, just above her ear before finishing her ponytail with a similarly designed hair tie. For a mare that despised nobility, she could easily look the part without question. It was just another perk of how successful her store had become. Without wasting anymore time ogling herself in the mirror, she made her way back down into where her shop was and saw that it was it was about an hour before the Gala was set to start. This meant that ponies would probably be arriving any moment now to get set up and to see feel out whom else was going to be here. Ice Storm quickly put on a smile. She thought back to how only a few years ago, she had struggled to find a footing, and now, with a few friends, and just a little bit of help, things has quickly turned around and now, she was hosting her own Gala!!! Granted, it was the gala for her guild, but they picked her to host it!! She was more than a bit excited and she wanted to make sure that everypony enjoyed themselves tonight. Tonight was going to be a very special night, and she would make sure that it would be no other way. With a deep breath, she opened the door to the outside, where it was a quite comfortable temperature, and looked into the stars and the moon that was making it's way into the sky, giving a small inward thank you at the guidance that she had received from not just the moon, but from the pony behind it as well. She gently stepped outside, and her dress shimmered in the moonlight as she waited for her guests to arrive. "I forgot how hard it is moving in a dress," Fire Heart said as she made her way to her marefriend's home, business, and tonight the party spot for Spellbound! She wasn't the type of pony to wear something formal often. In fact the last time she wore this particular dress (and the only one she owned) was at the last Grand Galloping Gala. It was certainly amazing looking at herself in the mirror with it. The dress looked like it was made of pure gold, accenting the red of her coat and orange of her mane and tail. Around the sleeves, collar, and fringe of the dress were golden accents which reminded her of the golden pieces that Princess Celestia wore. The same could be said for her shoes which were also golden in appearance. 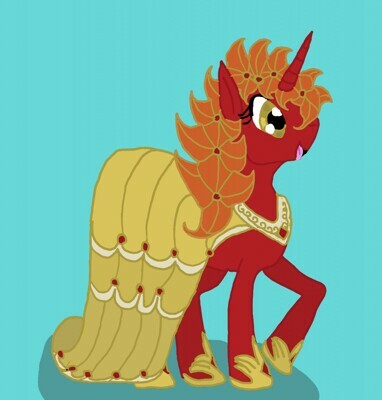 To complete the look, Fire Heart decided to style her mane and tail into something new, encasing it in a golden mesh. Even if she wasn't a Princess, she certainly felt like one tonight. She hurried towards the store, well as fast as a mare could in a dress without getting it dirty. It wasn't that she was late. She wanted to help Ice Storm out with the last of the preparations and say hello before the others came. As she reached the door the blue unicorn stepped outside, and what a sight she was gleaming in the moonlight! "Oh Ice," Fire said looking at her marefriend's appearance, "I...I mean you... whoa!" Walking into the brightly decorated hall is a family of four unicorns. Leading the way is a white bearded medium size dark blue furred elderly stallion dressed in his classic beret hat and green cape. This is Professor Hoofcourt (Starswirl) Magic, a long standing member of the Spellbound group. Following behind him are a slightly taller burgundy furred stallion wearing a blue fez hat and a blue white starred cape. He is Mighty Magic, Hoofcourt's son and part of a famous touring magic art with his wife, a navy blue mare with flowing purple mane dressed in a red white starred cape. She is Abracadabra. Their daughter is the last of their party to enter in. Misty Magic is a timid, petite yellow furred mare with purple mane who looked very awkward in her lovely blue ballgown. "I.. I don't know if I should be here tonight," Misty muttered as the four unicorns entered the room. "Nonsense!" Professor Magic neighed, "Misty, you are my granddaughter. Of course you are worthy to be here, you are my guest just as your mom and dad." "Don't be nervous, dear," Abracadabra said. "You'll be fine." "Your mother's right," added Mighty Magic. "All of us are here to have a good time and meet new friends." "But what if I, have any more.. magical.. mishaps.."
"It will be alright, Misty. Just be careful of the words you speak, all will be well. Ah! I see Fire Heart and Ice Storm have already arrived. Come with me, I'll introduced them to you," the bearded unicorn stallion spoke as he led his family over to the place where the two mares stood. "Fire Heart! Ice Storm! So wonderful to see you two once again. Have you met my family? This is my son Mighty Magic with his wife Abracadabra. Perhaps you've heard of their traveling Magic Show. And this is my granddaughter Misty Magic. Though she is young, I know she'll uphold the Magic family name and magical tradition well!" "Pleased to meet you both!" Abracadabra neighed. "Indeed! Dad has told us a lot about this fine organization!" added Mighty Magic. "Hi! Nice to, meet you," Misty spoke nervously. Thank goodness Rarity was able to fix Presteza's gown. It was such a shame that it has sustained such damage during the events of the joint attack of King Sombra and the Red Jarl; such a work of art to be tarnished by a pair of moronic, glorified , megalomaniacal thugs only made the mare grind her teeth in rage! Thankfully though her friend was able to fix this dress and make it look even better than before. The creme colored mare had dolled her hair up to look it's best while still having it's characteristic messiness to it. Behind her ear was a unique Fascinator that mimicked her cutie mark, hanging at the sides of her head were two braids that ended in a paintbrush like bundle of mane. The lovely seafoam green hoopskirt had also had it's hem lifted up slightly so as to allow the unicorn a bit more movement as she'd often found that she often could step on the dress if she walked too fast; an adjustment that earned rarity a hug of truly epic proportions. This exciteable painter could barely contain her desire to show this lovely number off. Bevel could honestly say this wasn't the type of place she envisioned when there were mentions of a guild who may be able to help strengthen her talents and research them further. When this painter she met on her travels said her guild was full of talented magic users like herself, Bevel thought many ponies alot like herself, serious, academic researchers hoping to bring advances the aetheric scientific community.. thus far they only seemed like a pack of imbeciles fooling around with magic but perhaps she was only seeing things skin deep as it were. The ward of the silverbeaks had promised that she would attend... and once the details were given she wished she hadn't; but a Silverbeak never breaks their word, so when the details of the dresscode and date for the gala were given she made sure to look good for this occasion for everyone else's benefit. There were some things that Bevel would never really get rid of and the pocketwatch necklace that was left to her by her father was one of them. The goggles that helped her discover her purpose in life were also hanging around her neck, the visual aides being replaced for the time being by her prescription glasses. She ma not have been a fashionista of any sort but she had a decent idea of what looked good on her. Tonight she wore a satin dress with a golden color with some silver highlights and thrills. Nothing overly complicated but good looking enough that it made her coat eyes really "pop" as the designer told her. Her mane was properly combed for once, showing off a big group of curls that now fluffed out a bit more than usual. "I guarantee, Bev. You'll find someone here you can click with and make friendships that will last a life time." Said the almost annoyingly upbeat artist. The inventor's eyes gave a roll and then lidded ever so slightly, "That's what they said about the magic school... and It didn't seem any more important than actual work there either. If you require my attention I will be getting punch." Just as the mare walked over to the punch bowl , Presteza thought to herself. "Such a ray of sunshine this one..."
Though some might not believe it off hoof, it was true - he was all too familiar with this type of dance and song. After all, remaining reclusive through choice and remaining reclusive through necessity were two entirely different things, and he did not care what division of magic or research or science a pony followed - collaboration and congregation were a necessity to any of them. Reclusiveness begat stagnation. Which was exactly why Nocturne Wisp hadn't immediately turned the other way when Pocket Change had made mention of a gala a few weeks earlier, hosted by Spellbound, for Spellbound. As disappointed he'd been with the open house, Nocturne wasn't fool enough to believe a coalition of high level magic users could teach him nothing. Spellbound had nuggets of ingenuity and intrigue hiding beneath its layers that would benefit him, Nocturne was sure of it. Which, in turn, meant making nice with fellow guild members. And thus, why he was trudging through the streets with an air of resolution, even if he was half wishing he had made plans to meet up with Change beforehoof. This was no different than the countless meetings, receptions, and parties he'd attended within research companies or magical communities. The dancing and the small talk, yes, they were cumbersome to deal with at best. But making connections - and perhaps finding out useful bits of interest - were well worth a single night of mingling. Though the location of the event had surprised him, Nocturne could admit. Why they had chosen to host the gala inside an...ice cream?...shop, instead of the nice big warehouse that boasted a practice floor in the basement, was beyond him. Perhaps MoonDancer had felt the place too run down to give off the impression she was hoping this gala would entice? Or too busy to actually host the thing itself, fostering it off onto another member. Then again, maybe all the senior members of Spellbound had come together, figuratively thrown their hooves into the air to shout, 'Why not? ', and then proceeded to build snowponies out of ice cream. "Hn," Nocturne grunted, a summary of everything he was feeling at the moment. And just in time, as he rounded a corner to suddenly find himself at the store in question, evidence by the myriad of ponies mingling right outside it. No Pocket Change in sight. Knowing the other stallion, he'd probably flooded himself with hearts at the thought of dancing with Moondancer and was subsequently stuck under a mountain of his own clichéd romance. In any case, no point in wafting about, and the darkly colored Unicorn made his way towards the entrance at a sedated pace, stopping behind what looked like a veritable family of Unicorns as he impatiently waited to enter the store. Judging from the lack of movement from inside the store windows, he'd arrived far too early, and Nocturne consoled himself with a quick rundown of the research supplies he needed to purchase first thing in the morning. A book of useful cleaning spells was high up on that list. Magically animated thorns could be...surprisingly volatile. Moony was referring to a celebration held at Canterlot Castle, held in honor of heroes like she and her coltfriend who helped put an end to the Nightmare Night Invasion. Back then, the young mare had only the bare essentials for black tie attire. Things had improved since, with Moony purchasing an “Over the Moon” dress from Canterlot Carousel for a very good bargain during its supposed going-out-of-business sale. It wasn’t everyday that fashion of a haute couture standard fell into her price range, and there was just no way the moon-flanked mare could pass up a dress emblazoned with crescent moons. To complete her elegant look, Moony had her mane wrapped in a Gibson tuck behind her neck. Attached to her ears were two modest diamond earrings, complementing the larger gemstones down at the bottom of her gown. A touch of rouge highlighted Moony's cheeks with a faint red blush. Most important of all however, the unicorn’s foreleg was intertwined with the offered leg of the bestest stallion in all of Equestria! Despite the considerable amount of time Moony and Pocket’s relationship has already lasted, it remained as strong as ever. By now, Moony very much entertained the possibility that it may always last. Holy Smokes! Pocket Change knew his eyes would be getting a treat this fine evening, but he was still caught off guard by the beauty he had seen so far. To start the night off, there was his very special some-pony and travel companion, Moondancer, who as usual looked as beautiful the moon and as radiant as the stars. That was probably what her cutie mark really meant. The next mare his eyes gazed upon was the owner of the 'Frozen Delights' and Topaz enthusiast, Miss Ice Storm. The well dressed mare organized the little Spellbound holiday together and instead of holding it at the usual guild hall, she invited all to attend said event at her place of business. He had heard about the little frozen custard shop and he was curious to see if the mare's frosty treats were as good as advertised. Next was Professor Hoofcourt and a small scattering of some of his family members. Pocket wanted to toss a few words their way, but the good professor was already chatting it up with their host, so there would be time later. The white stallion also caught sight of the ever loveable Presteza looking as stunning as ever. She was with a mare the unicorn had yet to meet. Was this a new friend? And wasn't Pressy dating somepony new? He had heard rumors of the bouncy befreckled mare had been dating noted cad and Ne'er–do–well Dr. Merlot. That was obviously a bunch of horse apples as the nasty unicorn was far too old for such a mare. Still, the new mare reminded him of somepony...Who was it? Nocturne Wisp! Not only was his old friend at the 'Hearth's Warming Gala', he was dressed rather well. He looked like an backup dancer for Sapphire Shores. Unfortunately he did not appear to be with anypony. If only he had asked his roomie Dazzle Dawn to come along as she was an bright blue ball of sunshine that every party should have. His grumpy pal had some sort of fancy golden epaulettes hanging from sides, but where was the one on his jacket connected to? Pocket almost wanted to follow it and see where it went, but that one make things even more awkward for the pair. Something started to bother the unicorn. He did not seem to be happy, but he still both was in the process of attending the guild's little event and he obviously put a good deal of thought into what he wore. Pocket would have to figure out what was going on with the stallion...But first. "Oh yeah. ", Pocket Change grinned as the mare kissed him. His previous favorite suit had been ruined during the changeling's attack during Princess Cadance and Shining Armor's wedding. He was still rather cranky about that. And then they bothered to attack the next big event he had attended, this time with Moony. Why couldn't those nasty bug-ponies leave Equestria alone? Knowing it would make him feel even better, he returned the kiss before turning his attention to his old friend, "You're looking well Mister Wisp." Knowing his mare would be dressed as lovely as any princess, Pocket Change made sure to dress for the part. The stallion managed to snag a decent enough suit at the 'Canterlot Haberdashery'. This made him feel somewhat sorry for the mares. They had to go through a great deal of rigmarole, from getting their hair, nail and makeup done to having rather complicated themed dresses made for just one occasion. While he just needed to pop over to a clothing store, find the right size shirt and jacket and wala! He was ready! The amount of time that Ice Storm had to wait before ponies began to show up to the event wasn't very long. In fact, Fire Heart could already be seen heading her direction, and her dress was immaculate. It shimmered in the moonlight with every step that she took towards her, the gold popping perfectly with her red coat. She felt her jaw drop a bit as her marefriend stood in front of her, and... judging by the expression on Fire's face, as well as her slightly stumbled speech, she could tell that the same thoughts were going through her mind as well. "Hehe, Thank you Fire," she smiled before walking up and giving her marefriend a kiss on her cheek. "You look amazing tonight as well. Your dress, your mane, everything just compliments you so well," she smiled before turning back as the next guests arrived, with what appeared to be many more behind them. She couldn't quite recognize them at first, but as they started to get closer, Ice Storm recognized them as Professor Hoofcourt and his family. The appeared to be deep in conversation before arrival, and almost without pause he turned towards herself and confirmed that this was his family. Specifically, it was his son, his son's wife, and their daughter. She gave a soft smile as he introduced all of them. "Good evening professor, I'm so glad you and your family could make it tonight! I have heard of their traveling act and I've been trying to pay attention to when it would be coming to Ponyville or Canterlot next, unfortunately, the two times it was there last, I was unaware of it, and I was at the opposite place at the time. I do hope to be able to attend in the future though!" she smiled to them. She did notice a slight hint of nervousness from the filly and she gave her specifically another small smile. "And don't you worry either little Misty! I'm sure there will be plenty of things that you can enjoy as well! I have lots of special treats, and perhaps somepony else will bring a another pony you can dance with," she smiled. Her goal for the night was to make sure that everypony left happy, and that meant every pony, regardless of how old they were. She wanted this night to be a special night for everypony in spellbound, and the guests that they brought with them. At this time a few more ponies began to show up. Pressy had shown up, and was busy in conversation with her guest. she gave her a smiling wave as she made her way inside, and Moondancer and Pocket Change wasn't too far behind them! As they approached she saw Moondancer spring over to where Nocturne was. Ice hadn't seen him show up but did notice kind of the glum look on his face. Hopefully he'd lighten up a bit once he made his way inside. After all, tonight was about having a good time, talking with old friends, and making new friends. 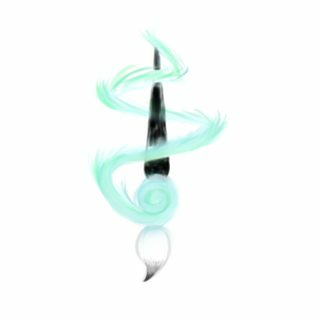 That said though, with a small smile, and a nod of her horn inside, she activated a small light that could be seen inside of a chandelier that through the reflective particles of ice, illuminated the room. Inside the room, was what looked to be like a massive tundra that spread out across a smooth, glimmering floor of turquoise and patches of white to simulate a snow covered, icy coast, boasting a mountain and sky across the back wall, making you feel that you were in a tundra. At this time, she turned back to the professor. "I do hope that all of you enjoy yourselves tonight." she smiled. If any day this month could be filled with so much win for Java, it would be today! Now… balls definitely were not his things, nevermind gallas. And he absolutely loathed dressing formally. BUT! What made this day so wonderful would that this would likely give him his first proper dance with his dream mare. Win! But back to the point! The brown stallion entered the gala’s doors, with a large smile on his lips. Like always, it seems the pony takes a great effort of care when it comes to attending formal events. Instead of coming in with his usual bedhead, and unkempt fur. He came looking sharp. And perhaps with a rugged handsome with a few beauty tips from a new good friend. He was wearing a cream colored tail-coat, well pressed and fitted to his body in a fashion that somehow perfectly display his bodily mix of a rugged draft and noble pony. Lining the trim of the jacket and making the overall appearance of the pony a bit brighter was an addition of burgundy. Of course, the same color was used for the silk lining inside the jacket, which showed off around the male’s color. Under the jacket was a vest using a darker shade of gold. Then, lastly… a burgundy tie. Tucked under the vest with a portion of it revealed. His mane also had a huge improvement as well. It seems his friend’s advice did some improvement there as well. Instead of the mad-scientist’s dome… he had his mane combed back with some careful stylizations that brought out is ears and professional look to him. His mane’s natural tendency towards a chaotic look still poked through… but it seems that it only adds to his look. A few thick strands of hair drooped from his mane’s edge, and hung freely, while some had risen up into a curled spike shape. Heck… it even looked like the pony slept! He seems perfectly aware and was standing straight and tall like a proper-esque gentle buck. There was still a bit of country-side mannerism in his stance, a light comfortable spread of the hooves, and a slouch to even out his weight. And on his back… was a utility saddle bag. You could take the disheveled off of a pony… but not their tendencies to underhand accessories. But… he seemed to have a good reason. Java had brought a number of wrapped gifts to hand off at the party. Which was a lot easier to do than tracking each one of them down… and possibly answering an embarrassing question on how he located them. But these gifts… ugh… they looked like they were horribly assaulted by a three legged spider and a paper factory. Because apparently Java’s gift wrapping game is as good as Princess Cadenza’s cooking. That is to say terrible. Each gift’s wrapping paper had multiple tares… revealing deeper layers of wrapping paper. Even if a box was used… and is in good shape, there are so many layers of paper duct tape to the thing that it almost looked like a rock. And even though he is an earth pony… there probably was no excuse to the way these things looked. Well, at last it looks like he tried… hard. Orange lights flickered in back behind the hosting place of the gala, bit of ash floating around from the seared debris. From within the fire, a young Pegasus emerged: her blue mane drawn into a soft braid draped over her shoulder, her light blue dress cascading down her hind legs. The fire flashed once more, and a Crystal Pony appeared. The mare's pink coloratura sparkled and shone, and her mane was adorned with small braids. Candles sighed as she changed from design to design, mare to mare, unable to stop at one. This gala was a special annual, a sign that-for a day-she could step in as a Changeling and feel right at home with herself. She was a free spirit, a bit a maverick-and she disliked being inhibited by one look and appearance. She was a Changeling, and they changed. A lot. She needed to make an impression, something that would set her apart in everyponies's memory forever. She was used to being ignored, unwanted and desolate...but then-this Spellbound thing. It had given her a chance. Granted, she had already established a reputation as a world-class fashion designer and a foreign relations ambassador-but, still: that wasn't her. It was Crystalline Fyre-Amore and Duchess le Chandelier. None of those were really her, the truest Changeling and Princess. She was Princess Candles, and Spellbound had gave her a chance to do what she wanted while being who she wanted. She changed through her forms again, before coming to a realization: They took me in as a Changeling. They accepted me for who I was. Why should I need to cover up for myself now? Just go in and be yourself, Candles. You don't need a disguise. You don't need a magical device that will help you hear. You don't need your sketchbook or any of your props. You don't need to look nice or good-you just need to look like yourself. She changed from her Pegasus disguise back into her Changeling self. A thin shield of magic wrapped around her, until it stuck onto her chitin like a spiderweb fabric and flowed into a long, graduating dress. The dress split into several different layers, each one contributing into the gradient of black to orange. It was silky and fluent to her tune of magic. She might not be a world-class designer in this form of herself, buts he was still a designer. Another shield of magic wrapped around her, and a thick cloak of medieval designs sparked to life. It was thick and plush, but soft and appeared to be stretchy at the same time. The bright orange graphics contrasted against the black material, and she looked very regal. Her headpiece adorned her mane, which hung lose to the side of her frame. Her long and slender horn maintained its eternal aura of orange around it, despite no spells being cast. It gave a soft light to the darkening ground, and paved her way to the front of the gala. Her steps were crisp and resounding, the chitin smacking against the floor. The front door lay behold to her, and she took a deep breath. Somewhere within herself, deep turmoil swirled. She was afraid. I'm a new member to Spellbound, but it doesn't mean they will see me as a stranger. Behind all the fashion and all the magic, she was afraid that they would judge her. She was afraid that they would taunt her-laugh at her disable hearing, wonder why she rarely talked. She sighed, and decided to go in before she changed her mind. The wind whipped around her mane, a magical wind. A dark atmosphere settled around the gala, and shadows seemed to rise from the walls. Typical Changeling entrance. Not typical pony entrance. Whatever lights in the gala flickered and some burst from her magic. Streams of orange magic shot out from her, and she noted several ponies engaged in conversation. The darkness descended like a fog, and awkwardness surrounded her, "Um...hello? I'm Candles-hi,"
Meanwhile, new arrivals kept on coming and coming. One of the ponies “bringing up the rear” was Ingrid Marie, guidance counselor at the School for Gifted Unicorns, and thus one of the members of Spellbound with the most professional clout. Having hardly attended any formal events that didn’t involve her (modestly-paid) colleagues in the world of magic academia, Ingrid didn’t plan on wearing anything too extravagant. For her, a red leg-covering dress with a white ruby-clasped blouse more than sufficed as formal attire. As far as the Apple-pony inside of Ms. Marie was concerned, no greater elegance could be found than modesty. Ingrid Marie did not come alone however; indeed, her two companions were the reason why she wasn’t as early to arrive to the Spellbound Hearth’s Warming Gala as some of the other guests. One of her companions was no stranger to magic; esteemed flora researcher Bramble Rose. Her other companion: Cheerilee, a humble school teacher living in Ponyville. Rather than risk having Cheerilee get lost in Canterlot trying to find Ice Storm’s ice cream store, Ingrid offered beforehoof to join her friend at the train station. Cheerilee was so happy to be invited to this party. She often felt it difficult to make friends in Ponyville. All too often, her friendships with other adults were marred because she had all their children in school. She had to be so careful about how she acted and what she did, and the conversation so often revolved around their foals. She got along with everyone fairly well, but close to home she was always concerned about putting on a bad example for the students. She'd really been enjoying Ingrid's company - they'd met several times, and even aside from having a fellow professional to discuss work with, they'd enjoyed each other's company in many other ways. Bramble, as well, was a pleasant fellow, if sometimes a little stubborn and disorganized. At least he hadn't brought a saddlebag full of books or notes along on this trip, instead cleaning up extremely well. In Ponyville, and on the skiing vacation they'd gone on, he'd seemed so ... ordinary. Here, in Canterlot, he suddenly seemed to stand taller and speak more eloquently, falling easily into the cultured Canterlot accent. As they'd walked to the party, he'd demurely and politely pointed out various spots of interest - some of them more touristy things, and others related to events in his foalhood - he'd apparently grown up around here. She really wanted to take Bramble along on her next vacation to Canterlot! He sure knew the area well, and she could only imagine what sort of little out-of-the-way local diners and interesting sights that weren't on the normal tourist routes he might know about. But for now, she was just thrilled to be going to a gala. Shed never gotten to go to a gala in her life! She had no idea what to expect, and was admittedly rather nervous about it, but she never let that stop her from trying new experiences! She did, however, wish she could have afforded a new dress - her gown was a bit conservative - a modest blue blouse and skirts with a purple bustle and bow. To counter the ... older dress, she had a tiny little black hat as an accent to her swept-up mane, three tiny roses tucked in along the band of the tiny hat - one red, one white, and one orange. The miniature roses were not artificial ones, but instead were a gift from the stallion accompanying them, who had felt the need to replace the simple felt blossoms she had originally been wearing with something more stunning. She'd actually watched him grow the roses right before her eyes, never larger than tiny buds but folding out in the most delicate tiny petals, and with such a strong fragrance. Self-consciously, she patted the flowers in her mane, and for the seventh time murmured, "Thank you, again, for the lovely roses, Bramble. They smell so fresh, and in the middle of winter!" She gave him a spontaneous hug, then stepped away embarrassingly. That certainly wasn't Canterlot-appropriate! They were all so formal around here! "Are you a member of Spellbound, Bramble? What do you think of all of this?" She paused a little, then asked, not sure if it was a rude question ... "Are you ... very skilled at magic? Or is your degree mainly theoretical?" As she was introduced to a changeling, however, she quietly murmured to Ingrid, not wanting to be rude, "Is it ... all right to have changelings in Canterlot? After the invasion?" She had never met a changeling before, and was worried she had missed some sort of diplomatic event between Queen Chrysalis and Equestria. But if the chnageling was out in the open, not trying to hide... surely if it meant harm ... she meant harm ... she'd be more sneaky about it? The feeling was mutual it seemed when Fire Heart saw Ice Storm and her similar awestruck gaze at Fire's appearance. 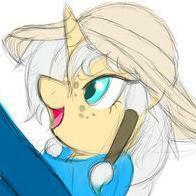 "Hehe, Thank you Fire," she smiled before walking up and giving her marefriend a kiss on her cheek. "You look amazing tonight as well. Your dress, your mane, everything just compliments you so well,"
"Thanks," Fire said as she blushed due to the kiss, "I feel kind of funny being in a dress, but I'm getting used to it. Can't wait to meet everypony from Spellbound! It's felt like forever since i last met them all." She didn't have to wait long as others started coming in, starting with Professor Magic and his family who were eager to meet her. "Nice to meet you again Professor magic. I've met Misty before, but not Mighty or Abracadabra before. I have heard of their show coming to Canterlot but I've yet to see it." Next was another group of ponies, some of whom she new very well and others she hadn't met much. "Hello Presteza and Moondancer! Nice to see you again. How have you been doing?" she said before turning to the mare Presteza brought with her, "Oh hello. Welcome to the party! I'm Fire Heart. What's your name?" Then there were three stallions who were part of the group: Java, Pocket Change and Nocturne Wisp. She unfortunately didn't have much time talking to them but now was a good chance. "Good evening to all of you!" Her body tensed a little upon seeing a Changeling walking towards the party, her mind flashing back to that moment when the Changelings attacked Canterlot. But this one seemed... nice? "Oh, hello there. You entrance is... very unique." Last but certainly not least was Ingrid Marie and another mare that Fire didn't remember meeting before. The magenta pony, however, looked like the academic type, perhaps a teacher. "Hello there Ms. Marie. Nice that you could come," she said before turning to the guest accompanying the counselor, "And hello and welcome to you too to the party!" With meeting the ponies present, she stepped into the shop/ party place to find it had been changed into a winter wonderland! It was as if she was walking along the hills on a snowy night. "Wow Ice, you really went all out for the party!" Bramble Rose entered the room with the two mares, smiling broadly. It'd been a while since he'd been at a party - and this time around, things were going so much better for him. Royal grant for his research, ongoing at the Tirac waste, and no longer doing odd little jobs for whatever bits he could scrape together. Not only that, but he'd never had to ask his mother for help. He'd managed it, on his own, just as he'd wanted! It'd taken years, and lots of hard work, but he was on his way! And now, here he was, entering a party with two lovely mares. He smoothed a hoof over the handsome black suit that Glitzen had made for him, and took off his hat to hang up as he entered in through the door. Glitzen had so wanted something more glamourous, but you just could not beat basic black. At Cheerilee's re-utterance of her appreciation, he gave a little bow in her direction. "My dear Cheerilee, joy in his work is the goal of any true artist. The smile on your face - that is the real gift here, and it is given to me." A bit hammy, but delivered in his crispest Canterlot accent. What could he say? He loved being home again. "As to skill, it's really a matter of perspective. In the traditional unicorn arts, I admit that there are scores of unicorns who surpass my talent. In terms of raw power, I am truly average. But within my own specialized field, I have a great versatility and finesse to my ability. Magic is not about power, though. It is about having the ability to be true to your dreams. As far as spellbound goes, though - I'm afraid this is the first I'm hearing of it. I've not been to Canterlot much of late." To be truthful, he'd been surprised the roses earlier had worked as well as they had - he'd been terribly nervous, and he tended to flub when he was nervous. The success at that spell was partly responsible for his current self-confidence. His feelings about Candles weren't that far from Cheerilee's. However, he had his party face on, and that was better than any poker face. His dam would never have allowed even such as this to make him flub his genteel manner, no matter how scared or startled he might be. He stepped forward, took Candles' perforated hoof, and bent over it in exquisite politeness. "Well, when Ingrid had been extolling the virtues of this party, miss, she certainly failed to mention that there would be such an exotic beauty. When the dancing begins, I'll certainly have to reserve a spot on your card." In hindsight, Crystal Clear had been...less than her usual social butterfly self, the last--and so far, only--time she had joined these ponies for anything. Her first day at a meeting had quickly diverted most of her attention to working at some new, small spells, and by the time it had finished she was so worn out and overmagicked that she'd already boarded the train back to Roam before realizing she'd barely talked to anyone. This was not to be the case this time, oh, no. THIS time, she was determined to put her best hoof forward and present a proper impression to her new guild fellows! And really, how lucky for her that the opportunity had presented itself in possibly the best way to show off all that she stood for! It had taken some extra time and effort to adequately prepare, of course. Never one to chance making the trip across Equestria in her best finery, Crystal had taken the time out of her work schedule to book a room in Ponyville for the next couple of days, both to save herself a long late-night trip back home and to give herself a base of operations closer to the gala's location. And the ornamentation and fine details had almost had her worried for a while, but bless her father's patient heart and extraordinarily skilled hooves and eyes, he had come through to a tee, and she couldn't be happier for it! Crystal turned once more in the little room's mirror, scrutinizing herself for any needed adjustments or details out of place. It seemed all was sound for now; the dress rested nicely on her frame, the swaths of opulent indigo cloth flowing elegantly with her movements, and the intricate tight curls she had woven her mane into were still smooth and impeccable, nary a single hair out of place. But lovely as the dress and hair were, what was a glassblower mare if she didn't show off a little bit of sparkle? Between the dainty diadem tucked just behind her ears, the belt of filligree and jewels sewn into the waist of the dress, the diamond drop earrings, and--most importantly--the crystalline sleeve clasp crafted in the likeness of her cutie mark, Crystal believed that she and her father had both done a stellar job in ensuring that she would truly shine at the ball this night! "Crystal Clear, my dear, you have truly outdone yourself this time, haven't you?" the unicorn sang, permitting herself one last brief moment of indulgent vanity and primping before moving on to her humble face. It would be about time for the gala to start by now, wouldn't it? She'd best head on out, then--not much use being late for her first real social opportunity within the guild, was it? Sure enough, after a short stroll down the boulevard, there were all the other finely dressed ponies beginning to gather--and there was the place itself! Talk about elegance, indeed--just look at how radiant the room was, how...how shimmery! Oh, how the lights scattered and twinkled against all the ice and snow! It was enough to send this mare's shiny little heart all giddily a-flutter with glee--why, if she didn't know any better, she might just end up squealing aloud with delight! ...it took a moment for Crystal to realize that that was precisely the high-pitched noise she'd started to hear all of a sudden. The mare clapped a hoof down over her mouth, clearing her throat quietly and glancing furtively around to make sure nopony else had heard her having a moment. Not nearly as extravagant as she imagined his entrance would be... but his appearance more than made up for it. Yowzah! Did he look sharp! you could practically cut yourself if you touched him! It didn't take long for the stallion to find his special somepony at his side and planting a kiss on his cheek as her eyes took in his cleaned up appearance. "Ya look wonderful, love! I especially love the new manestyle... but I think your natural state is the best for your everyday appearance." "So ya brought gifts didja?" She asked with a playful smirk as she looked over the sloppily wrapped gifts, if anything Java had character when it came to wrapping presents... quite a distinctive design. Holy cow! A changeling was a member of spellbound?! Before Candle knew it the painter was next to her and fire, "By starswirl's beard! I can't believe this! I got to meet two friendly changelings in the same month and one of' 'ems a member of moony's guild! Java, how cool is this?!" she asked in a positively excited voice looking like she could almost explode with the force of her sheet enthusiasm... and no, she in fact had not gotten into java's coffee stash. "It's awesome ta meet ya, candles! Oi'm Presteza, and this lovely red mare is Fire heart! How are you finding your time in the guild so far?" she asked, a big grin on her face. A changeling? Fascinating. Bevel had been hoping to get a better look at and analyze one of them. Her thoughts on the species were not as harsh as most ponies seeing as she really had no investment whether or not canterlot fell to them or not when they invaded during a wedding. The only thing that got her interest about them was that disguising ability, that could be very fascinating to study... although she couldn't foresee some changeling willingly giving away the secrets to their abilities (if they even knew the magical mechanics of it at all.) Imagine the applications for Aquellian intelligence if they were able to assume the forms of others ... it was fascinating to think about. Bevel would need to make sure to speak to this mare; if that was the correct nomenclature for changeling females. The Flame themed mare that approached her next seemed mildly interesting. Just by looking at her scheme and if she'd heard her name right she could guess what her talent was. In her time in Canterlot she'd noticed a worrying trend in unicorns with such magic having issue controlling such a wild form of matter. After her harsh gaze scanned over Fire's features she simply nodded and spoke up, "My name Is Bevel Gear." She wasn't one for conversation, it's not the question gave her much room for response anyway. So far, so good for the Magic Family tonight. Professor Hoofcourt Magic had successfully engaged with both the party's hostess Icestorm and a promising magic student. "Good evening professor, I'm so glad you and your family could make it tonight! I have heard of their traveling act and I've been trying to pay attention to when it would be coming to Ponyville or Canterlot next, unfortunately, the two times it was there last, I was unaware of it, and I was at the opposite place at the time. I do hope to be able to attend in the future though!" "Thank you, Icestorm," Professor Hoofcourt replied, "I am grateful that my family could be here to experience Hearth Warming Eve in such distinguished a group as this." "Perhaps you could take in our show some other time," Mighty Magic said with a smile. "Indeed. Icestorm, about how many members are there in Spellbound?" Abracadabra asked. "And don't you worry either little Misty! I'm sure there will be plenty of things that you can enjoy as well! I have lots of special treats, and perhaps somepony else will bring a another pony you can dance with,"
Misty Magic smiled before she spoke, "There will be dancing tonight? That's wonderful!" "We're happy to meet you, Fire Heart," Abracadabra began to speak, "our daughter speaks very highly of you." As Mighty Magic and Abracadabra greeted the firry unicorn mare with a hoofshake, Misty began to feel more at ease. "Wow grandfather! I didn't know Fire Heart would be here! I hope the dancing starts soon! That's something I'm really good at. Even my dance instructor back in school said I was very light on my hoofs..."
Suddenly, as Misty Magic stopped speaking, her horn flashed and before she could react, the petite yellow furred unicorn mare found herself floating upward, above the gathered crowd. "Oh no! I did it again! But I didn't mean to!" Misty shouted as she continued to hover in the air. Looking all around, in the distance she spotted Ingrid Marie, the famous magic teacher who had tried to help Misty with her, 'magical mishaps.' "There's Professor Marie! If she sees me floating up here, she won't be very happy about it. Mom? Dad? Grandpa? Please get me down." Mighty Magic nodded and used a spell on his airborne daughter, but to no avail. Her mother tried also, but she also failed. "Do not panic, Misty. This particular spell requires YOU to end it. Think, concentrate, you can do this! Cast a counterspell." "I'll try, Grandpa," Misty muttered, closing her eyes to focus. Her horn flashed several times, but there was no effect. Now Misty was starting to drift towards the center of the gathered guests. Realizing this only made the floating unicorn mare even more nervous and embarrassed about the situation. "Come back here, Misty!" Abracadabra called out. "You need to relax, Misty," the Professor said as he and her parents followed her from below, "focus on the task of returning to the floor. Do not let anything distract your thoughts.."
But poor Misty was now in full panic mode. She wanted to just hide or disappear but was so frightened to speak out again, all she could do was stutter as she continued to float above the crowd. He should have expected it, really. But expecting something didn't necessarily equate to a changed outcome. If it had done one thing right, the Spellbound Open House had effectively cured the last remnants of a foolish schoolcolt's romantic affections for the white coated mare springing up to him, so there was that, he supposed. But even with those last scant vestiges dead and gone, Nocturne couldn't even hope to pretend that his friend wasn't an attractive pony - in fact, to deny it would have been foolish and foalish both, and the dark colored Unicorn mercilessly squashed that by-gone part of his heart. Pocket Change, too, looked done up and done out, and the pair of them easily made for a handsome couple. Watching the two of them approach in the faint light reflecting from out of the shop, Nocturne Wisp wished, just a little despondently, that he could tell them so. "Moondancer," the Unicorn settled on saying cordially, and felt the faintest of blushes slowly creep across his snout as his eyes caught on the shimmer and sparkle of her dark purple gown. "You...you look..."
"...good," Nocturne finished lamely, eyes glaring holes at the lamppost behind and to the left of Moondancer’s head. From there however, it was easier to turn towards Pocket Change, safer territory and yet all the more treacherous, bated breath let out to allow a genuine smile to cross over his face. "And you clean up almost as nicely," he murmured to his friend, the barest hint of a huffing laugh in his voice. - and suddenly, they were not. Despite himself, Nocturne Wisp couldn’t help feeling a bit impressed as he surveyed the area they were now standing in, illuminated by the ice chandelier hanging from the ceiling. If he hadn’t know beforehoof, he would have never guessed the building was an ice...ice cream? Ice bar?...shop. No, he probably would have wagered it to be some sort of winter-themed performance bar, or similar. The snowy mountaintops and blue-lit sky on the wallpapers were especially convincing, and, in areas where the meeting of wall and floor was hidden, almost gave the illusion of a large, open tundra. Nocturne was still contemplating the setting when the sound of his friend’s voice being bellowed from across the way gave him pause - which, in turn, gave way to a slightly lowered eyebrow as he identified the brown stallion boisterously summoning Pocket Change to him like a lapdog. It was the same stallion that had ignored him, Nocturne, during that ill-advised camping trip in the Everfree Forest, deigning to speak only to Change while he’d been standing right at his side. Nocturne certainly didn’t mind not being interacted with by strangers, of course, but even he had basic manners. Luckily for him, that was all the time Nocturne was given to remember that annoying adventure - but the interruption was not so lovely, and it was enough to make his ears fall backwards, reflexively, at the sudden appearance of a Changeling. He...hadn’t know Spellbound accepted Changelings. Whatever words he wanted to say instinctively caught in his throat, as Nocturne glanced first at Moondancer, then Change. Two of the founding members of Spellbound were right there with him, and if they hadn’t know about a Changeling’s induction into the guild, Nocturne would eat his horn. Out of respect for them, the dark colored Unicorn kept his silence, even if his pale gaze narrowed in on the Changeling. ...No use raising up a fuss, though Nocturne would surely bring it up with Change in the future. For the present, there was some catching up to do, and he turned to his friends to do just that. Until a squeal preemptively stopped everything. Starswirl’s beard. Nocturne resisted the urge to rub his ears at the high pitched noise, instead choosing to swivel his glare in that direction - though, sudden shouts and cries seemed to indicate a reason for the squealing, and the dark colored Unicorn could only stare, bemused, at the young looking mare floating overhead. ...Really now. Hardly a minute into the door and Unicorns were already getting into the punch? Though, listening to the mare’s presumed family raising a ruckus and effectively taking over the space as they followed underneath her, it became obvious the yellow mare had no control over whatever magic had uplifted her in the first place. Even more than that however - and to Nocturne’s considerable surprise - the elder stallion easily identified as Professor Hoofcourt was doing nothing to rectify the situation, instead allowing the spectacle to disrupt the gala. Said lack of action was soon, apparently, explained as the Professor attempted to get the mare to cancel her own spell. Calm and serene, he was a direct contrast to the clearly out-of-her-league mare. And while Nocturne could appreciate leaving a pony to sort out their own created mess, they were causing a scene in public, for Celestia’s sake. Scowl now firmly in place, the dark colored Unicorn flared up his own magic, a fairly powerful Cancel - only to be met with the magical equivalent of a slap in the face, his magic ineffective against whatever spell the mare had cast. Teeth gritted, Nocturne abruptly switched gears to an anti-levitation spell, hopefully an antithesis to the mare’s own magic, and with a firm stomp of one hoof onto the floor, he focused all his efforts on down. So fastidiously was Nocturne focused on breaking through the strong magic encompassing the mare, he almost didn’t realize exactly how much he’d attempted to overpower and cancel her out, not until she was almost slamming against the floor. As it was, the darkly colored Unicorn was just fast enough to pivot his center to reverse the effects, and with a sharp "Tch! ", his magic was released, and the yellow mare abruptly dropped onto the floor at a safe height of point three meters. If she’d been anypony else’s relation, he would have settled for three meters. Intriguing, however - that mare was more powerful than she looked. Nocturne could feel a bead of sweat making its way down the back of his neck. But he’d warm over in Taurtarus before admitting to it, and with a deferential nod towards the esteemed Professor - and a withering glare at the yellow mare herself - the Unicorn was finally able to focus on what really mattered. "Whatever you two authorized to be put in the punch had better be legal," he half-joked, pale gaze sweeping over Moondancer and Pocket Change as he straightened out his tie. "I didn’t think ponies started floating until after the start of the gala." Hearth's Warming was a time for love, togetherness, and friendship. Witchweed Charm was in low supply of all three, but she'd managed to pay her dues to Spellbound on time and an invite had found it's way into her possession. She'd told herself that her membership, and moreover her attendance to this event, was simply an extension of her research, a way to make needed connections in the magic community, advance her skills, and ensure her eventual place in Equestrian history. It certainly wasn't to make sure she wasn't terribly lonely at this time of year. This was just something she needed to do. She had several appropriate dresses, having been dragged by her family to a number of social events, but they were always...drab. Appropriate, but never stunning or flashy, simple elegant designs that did not invite a second look. Still, it was easy enough a matter to pick one appropriate to the occasion and style her mane and tail accordingly. Arriving at the Gala and walking in. her posture was elegant, but business like, head held high, neck straight, though her gait left an akward bounce in her step upon small bla. Witchweed Charm's hair had been swept back over her ears into a bun, bangs blunt, held in place by two red wooden hair pins styled into thorny spirals at the top, complementing the maroon dress she wore, the collar on the neck directly connecting to the bodice leading into a split skirt allowing her tail to freedom of movement. She might have looked lovely, were it not for the serious expression on her face. Stopping at the entrance, she quickly scanned the room, intent on making polite introductions one at a time, identifying several small groups. And then she saw the changeling, casually conversing with other ponies. It was there, plain as day- no kicking, no shouting, no blasts of magic leveled. It also wasn't quite like the buzzing horde of diminutive monsters that had invaded, so... perhaps it was best to with hold any reaction, for the moment. Instead, she looked for the closest pony to seem unengaged at the moment and make a beeline towards them, in this case, being the cerulean unicorn clad in indigo cloth and sparkling jewelry, Crystal Clear. “Darling, I really like the way you fashioned your hair, it's so... springy. It's so nice to finally attend one of these events and meet my fellow guild mates. I'm Witchweed Charm, and you are?” Witchweed started, her voice having a mild undertone of... aggression? Irritation? Awkwardness? In any case, it did sound a little fake, if nothing else. “Tehehe, thank you Wispy,” Moony playfully accepted Nocturne Wisp’s compliment; “Happy Hearth’s Warming!! !” Without giving Nocturne a chance to object, Moony leaned in to give her old magic school pal a quick, light hug. Gotta spread that holiday cheer around to one’s close friends, you know. Fire Heart was the second pony to greet Moony. “Me and Pocket are doing wonderfully, thank you!” The moon-flanked mare also gave Fire a brief hug; “Oh tell me, did your dress melt Icy’s cold heart by any chance?” It wasn’t exactly a big secret that Ice and Fire were... “singing together” now, so Moony felt compelled to playfully make light of it to Fire, winking as she did so. Not long after that, Moony’s ears picked up her name being called. “You hear that Pocket?” she turned towards her partner, excitedly but gently pulling him along; “Java’s got gifts for us!! !” But just as she and Pocket reached Java and his bag of presents, a new guest made their grand entrance. “Speaking of changelings...” Moony whispered to Pocket. To be truthful, the senior guild member’s prior bad experiences with changelings had made her untrusting of Candles at first. After consulting with Princess Celestia though, Moony learned that there were many changelings, entire hives even, who don’t swear fealty to that war-mongerer Queen Chrysalis. Thanks to Celestia’s assurances, Moony decided to welcome Candles into Spellbound with open arms... and it looked like many others (like Pressy) would be doing so tonight. Yet just as Moony turned back to receive whatever gift Java had in store, panicked cries diverted her attention yet again. This time, somepony she didn’t already know was floating on the ceiling, apparently not on her own accord. The girl did recognize Prof. Hoofcourt, Might Magic, and Abracadabra, so she stayed back, figuring they’d handle the situation. As it turned out, Wispy fixed everything up... and right afterward, accused Moony and Pocket of causing it! “What do you mean, Wispy?” Moony coyly rubbed the back of her neck; “Would I ever spike somepony’s drink with a fizzy lifting potion?” As a matter of fact, Moony had done that sort of prank multiple times back during her magic school days. Ice Storm gave a small smile as the conversation ensued with Mighty and Abracadabra. Her smile broadened when they said that they could take her in one of their shows some other time. "Oh, that would be amazing! I don't have a lot of showy spells, but you'd be amazed of what kinds of things can be created out of Ice alone!" she smiled as Abra asked how many members of spellbound there were. "Well, right off the top of my hoof, I have no idea, but I know we're supposed to have around twelve or so members here tonight, perhaps a bit more perhaps less, plus their guests," she smiled as Misty seemed to perk up from the sound of Fire's voice. It appeared that they also had gotten along quite well, and of course, it wasn't hard to see how somepony could easily get along with her fiery friend. She was always a joy to be around. About this time though she noticed a few other ponies beginning to head in, one of them, an earth pony, who seemed to have a much more serious look on her face than most that had arrived so far, as well as Ingrid, one of the magic instructors at the college. Ice Storm had never studied with her personally, but she had heard great things about her. The last pony that stood out though, in fact wasn't even a pony at all, but a changeling! And by the night of Luna what a sight she was! The gradient black and orange dress, the elegant, yet intricate designs that were on it, and the way her accented her chitin, it was amazing! It was true, she had heard about what happened with the Changelings in Canterlot, but she also knew how overtly mean some ponies could be. So figuratively, if there are many different types of ponies, how hard was it to presume that there were many different types of changelings? The answer? It wasn't. Ice Storm herself had never had any sort of encounter with Changelings before, so she had an open opinion of them, and so far, the experience has been quite positive. When she spoke out and introduced herself, Ice smiled. She would have instantly replied herself, but her marefriend had quickly beaten her to the introduction, and Pressy quickly, and much excitedly followed her in hoof. She introduced both herself and Fire Heart and asked about how she was enjoying the guild so far, electing another smile from Icy. "And I am Ice Storm, the resident Spellbound ice mare and hostess for tonight's Gala. I must say, your dress looks absolutely amazing. I love how the orange helps accent the gold in your chitin. It is a very well thought out design, and I say you pull it off quite well indeed," she smiled hoping to help calm the poor mare's nerves. She could hear the nervous tone come from the changling from her introduction. She noticed Nocturne, whom had almost stopped dead in his tracks as he saw the inside of the shop after giving her a brief nod in acknowledgement. The same reaction that many others had displayed when they had stepped inside her shop for the first time. In fact, for some of her costumers, it was one of the many reasons they kept coming back. She even overheard Moony mention that the only thing else that would have been needed was an Aurora Borealis, and she'd be set. Something that if she could find some of her water dyes, she could also create with her chandelier, but that would have to be for a future event. She dare not risking even a drip of dye falling on anypony's dress. She'd be absolutely sick with herself if the color dripped and ruined somepony's very expensive dress. No, perhaps that wasn't a good idea after all. It was about this time however when the first setback of the night started. It had become apparent that Professor Hoofcourt's granddaughter Misty wasn't completely in control of her magic. This became apparent as she was talking excitedly about Fire Heart being present tonight and made a comment about being light on her hooves when she was dancing, and the mare herself appeared to become as light as a feather and began to float on her own. Both her mother and father tried to help, but they were unable to do so as the Professor explained that the particular spell that was used, would have to be self canceled. With as anxious as the mare was though, concentration wasn't going to be something that came easy. Without wasting any time though, Nocturne began to assist and he tried to help counter the magic that was being unwillingfully cast by the mare that was now floating over the crowd. It seemed to have worked, whatever he had done and carefully dropped her from just a bit off the ground so that she wouldn't get hurt. When he made the comment about whatever was in the punch being legal, she gave in an inquiring look before noticing that it appeared that he had been joking, or at least wasn't completely serious. Though the response from Moony didn't really seem like it would have helped the situation at first. Because her spiking the punch with a Fizzy Lifting Potion did seem like something that she would do at some point. However, Moony did come back to say that she hadn't touched the punch, and that it was herself that had made all the treats for tonight, to which Ice Storm nodded. "Well, I didn't make all of the treats tonight, but I made all of the edibles and the punch for tonight yes. Although I do have a ten bottles of Maroët-Chanpony from Prance available for those who wish for some. Only the best would do for tonight," she smiled hoping that there wouldn't be too many more setbacks tonight. Pocket Change managed to stop and admire the party's host and the rather interesting display that she had set up with an chandelier and what appeared to be an large room sized light illusion spell? Something that could be maintained by the large light source. It was very impressive, but it did remind him that days that will only get colder as the winter slowly slogged on. Hopefully the next party/event/hootenanny will have an Gallopocous Island themed. With sand, surf and Moondancer in a bikini. Still, he couldn't help but be impressed. Most would have been satisfied with crepe paper snow-mares and plastic icicles. Being a proper Canterlot stallion, the unicorn added an, "Well done Miss Ice Storm! I don't believe I have yet to see an display as impressive as this one!" As he took in a few more of the mare's theming, he, along with Moondancer spotted Javasun who had brought gifts! "I actually had a delivery-mare drop off my gifts before the start of the gala. There's a little something for everyone." Oh Hearths Warming Eve. This really broke the bank for the stallion, so he would be eating easy-heat noodles and drinking generic soda for the next few months, but it was worth it. He just hoped his friends would like their gifts. As the unicorn made his way towards the brown stallion, something caught his eye, which made him stop. There was a mare doing some sort of illusions of her own. But she was a Pegasus? Was the magic weaved into her clothing? She quickly shifted into the form of an crystal pony, and them....an CHANGELING? Galloping gorgons! This was horrible! They weren't five minutes into a party and these horrible creatures have already invaded! Talk about a party crasher! Soon more would show up and they would have to fight their way out, making sure to protect everypony! Pocket tried to figure which of his 'impressive' catalog of offensive spells he would use against the horde. He had two spells to pick from. Could the changeling survive the wraith of his powerful tickle spell? Or his unstoppable 'poke' cantrip? Sweet Celestia! He needed to learn how to summon a 'fireball'. Seeing how nopony else was worried, at least from where he was standing, and even Moondancer mentioned that she was in their guild, "Oh really? ", he whispered back to the mare. "I did not know that." She would be an interesting addition to their little gaggle of pon...people. And he would have to chat with her as the unicorn had a rather large list of questions he had. This would have to wait for another time. Now relaxed, he gave Candle a friendly smile before he cantered on. Her status with the guild was reinforced by an emerging Ingrid Marie who brought along a small group of ponies he had not seen before. Pocket's ears perked up as somepony was singing? That was hardly a rare thing to be heard in Equestria. Cripes! Their little guild sure has grown up during the last few months. He just prayed that they would be able to keep it orderly as it gained in size. And in a moment, there was a rise in activity over with Professor Hoofcourt's family. Oh heck. Thankfully, it would be contained, considering the old stallion was one of the better teachers out there..Pocket hoped he would be able to chat with all at the event...Even Nocturne seemed to be, er chatty. While Pocket Change believed Moondancer deserved a far better description than 'good', this was a major complement coming from the slightly sour stallion. "Darn right I do. ", feeling the need to do so, the white pony quickly fixed his old friend's tie with a slight tap with his telekinesis spell. "And nice suit you have there. Almost makes you look like an officer. Not sure where the one rope goes, but I'll just assume it's attached to the other side of your jacket. Erm", he murmured. He knew his friend had a few unique ways of looking at life, but would having a special somepony like Dazzle Dawn make him happier? His day was always improved a hundred times over when he got to see his beloved Moondancer. "I didn't make the punch this time. ", the stallion added, "And I sure nobody put anything in the punch as we knew there would be children at this event. Still. ", he pondered out-loud, "We'll need to have an adult only event one of these days. Maybe see about having it at the 'Ponyland' over in Canterlot. Great little jazz club....Oh nutters." Some sort of magical event continued to happen with the professor's kids, which was stopped by his old friend. Thankfully nopony else needed to get involved. "Good show old boy...We need to see what Java has for us and we'll talk in a moment." he waved a hoof towards a festive and very festooned Hearth's Warming tree, "Left something under the tree for you. Hope you like it." Once at Javasun's side, Pocket Change grinned, "Sorry it took us so long to get to you..", he decided not to make a joke about needing a list for three names, and instead gave his friend a quick hug, "Also have a goodie for you under the tree." His ears perked up a little as he overheard their host mention the wine selection. The gal sure has good taste! As Mighty Magic and Abracadabra looked up in fear for their daughter's safety, Nocturne used his magic to bring the frightened Misty back down to the floor. Overjoyed, her parents rushed over to thank him. "Thank you, young stallion!" the middle aged mare neighed, throwing her front feet around his neck to give Nocturne a quick hug. "Yes, thank you indeed!​" added Mighty Magic, "my wife and I are in your debt." 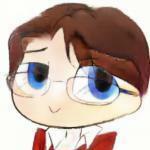 ​​​"Thank you, kind sir," ​Misty said before turning towards Professor Hoofcourt. ​"Grandpa, I don't understand. I thought you said that I was the only one who could reverse this spell." ​"Forgive me, Misty," the elderly unicorn stallion began to explain, "but I said that in hopes it would inspire you to break the spell yourself. I should have realized you were too frightened about the situation to focus. I am truly sorry." "Guess it doesn't matter anyway. Now no nice stallion will want to be seen with me let anyone dance with me. I feel as useless as a crooked horseshoe!" the petite unicorn mare neighed, instantly triggering a small black cloud appearing high above her with many bent horseshoes starting to 'rain down' all around her. This time, Professor Hoofcourt acted fast, making the cloud and falling horseshoes vanish with one magical flash of his horn. Seeing another magical disaster caused Misty to sob as she sat down at a nearby table, silently pondering. Misty's mother quickly sought out the party hostess. ​"Sorry about all this, IceStorm," Abracadabra said apologetically. "I know it wasn't our daughter's intention to cause any disruptions tonight." Bevel's face scrunched up as she heard the stallion say something about being put in the punch, only the words from the mare he was talking prevented her from doing a spit take right out of a low brow comedy of somekind. The mare swallowed her drink with a somewhat suspicious expression... looking around and taking a step away from the punch bowl and closer to the other end of the room with more ponies by it. At least there she might be able to find a pony worth speaking to... or just find a nice spot of wall to make her acquaintance with. The dusty brown mare scanned over the group of ponies present and so far the only pony here who looked like they could speak with her was the stallion whose previous words almost caused her to give the area in front of her a brief shower. He seemed the knowledgeable type, his face seemed vaguely familiar but she couldn't place it. As the ponies he was speaking to made their way towards the brown stallion of whom made her coat crawl, Bevel made her move and stepped up calmly. She approached the dark blue stallion and inclined her head slightly in greeting, "Hello... please don't take this the wrong way, but I think I've seen you before. Did you go to the school for talented unicorns and if so, what classes did you take?" Before Nocturne could even think of a curt reply to the middle-aged mare, she was putting her forelegs around him. The darkly colored Unicorn was certain he faltered back a pace under the onslaught of thanks and hugs, the tell-tale burn of a flush tickling the back of his ears, but the violation of personal space was mercifully short, the mare pulling back almost as quickly as she had surged forward. Nocturne Wisp cleared his throat roughly, resisting the urge the straighten out his tie again, but he'd no more than given a low grunt of acknowledgement to the family's thanks before the yellow mare was causing another scene, a warbled neigh of foalish insecurities quickly followed by magical horseshoe rain. Nocturne was fairly certain his glare couldn't burn any brighter, and he was quick to turn his head away in disgust as the mare galloped off to sob in a corner somewhere. Bad enough to have so little control over her own magic...but her emotions, too? Ponies who were quick to causes scenes in public were high up on the list of ponies he needed to avoid at all cost, in order to preserve his own sanity. He had other, more important things to ponder anyways, and that arched tone was certainly reassuring. Not that Nocturne held any belief Moondancer would deliberately or maliciously harm anypony, but there was no denying that the white mare had grown into a bit of a prankster while he'd been off traversing through the Everfree Forest after graduation. That little bit that had been off putting during the Open House was becoming more and more apparent, a sort of silliness that he might have despised in any other pony. As it was, Moondancer was special, and clearly not out to poison anypony's punch with an extract of Poison Joke, so the dark colored stallion simply narrowed his gaze as both the mare and her coltfriend denied any involvement in the punch making, casting suggestion onto the ice-colored mare - Ice Storm, he was eight-seven percent certain - who was playing hostess this evening. She, in turn, seemed to deny any such illicit activity, and it took Nocturne a moment of rather intense staring to realize that all three ponies had, to some extent, believed he was seriously accusing somepony of spiking the punch. 'And Change says I can't make jokes,' the Unicorn thought to himself, just a little bit smugly, before refocusing back on the conversation at hoof. A good thing, too. Despite himself, Nocturne couldn't help the briefest rush of gratification that flowed through him as Ice Storm mentioned some expensive bottles of wine stashed away for the evening, causing him to give a sort of affirmative grunt of pleasure at the mare's words. He wasn't much of a heavy drinker, himself, but a nice glass of Champony every now and again was a boon, even if some of the more expensive brands ran a little too rich for his tastes. In fact, enjoying a nice, quiet bottle of wine with his friends was sounding more and more exquisite by the second. Such fantasies were all too quickly eradicated, however, as Nocturne was abruptly reminded that his friends didn't belong to him this evening. Change and Moondancer were off to converse and accept gifts from the brown stallion, and Nocturne struggled not to shuffle awkwardly as the two made their ways towards him. He was not, after all, going to trail after them like a lost puppy - but neither was he going to stand here with a mare he was unfamiliar with. Nocturne excused himself with a nod as their small group dwindled downwards, a quick glance over the hostess before he was moving towards the outer rim of the building - or tried to, at least. Only one step forward before he was stymied by another white mare, one who, though as elegantly put together as Moondancer, ruined the look with a pair of goggle dangling from her neckline. Whether she had left them there on purpose, or was so absentminded she'd simply forgotten to remove them, Nocturne couldn't say, and he glared at the innocuous pair a little while longer before bringing his gaze up to meet her own yellow one as she started speaking. And immediately prefaced her question with a reassurance of good will. Hn. "I did," the dark colored Unicorn stated shortly, pale gaze narrowing a bit at the obvious implication of the two of them having met each other at some point. "And I took several." Nocturne wasn't sure what this mare wanted...instead of introducing herself to see if her name or...classes, sparked any memory within him, she'd turned the tables to get his information first. Information he wasn't willing to give to a complete stranger. ...Though surely, she hadn't expected him to list off every single class he'd taken during his school years? Preposterous.